FILE - Sudanese President Omar al-Bashir is seen during the opening session of the AU summit in Johannesburg, June 14, 2015. South Africa's foreign minister has gone on the offensive against the International Criminal Court over her nation's failure to arrest Sudan's president in June. The ICC gave South Africa until October 5 to explain its actions. South Africa’s foreign minister has asked the International Criminal Court for more time to explain her government's decision to not arrest Sudan's president, despite a domestic court order that sought to prevent him from leaving the country. Minister Maite Nkoana-Mashabane also threw a few jabs at the international court, adding fuel to tensions between the court and many of its African member states. All nine of the situations the court is investigating are in Africa. “South Africa was unfortunately not afforded the opportunity to present legal arguments on this application, and hence it is of the view that the principles of justice were not adhered to. In view of the above, South Africa is of the view that a serious infringement of South Africa’s rights as a state party has taken place and that the court has acted against the letter and spirit of the Rome Statute,” said Nkoana-Mashabane. South African officials say Sudan President Omar Bashir enjoyed diplomatic immunity as a delegate to the African Union summit in Johannesburg. 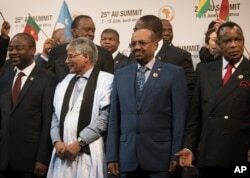 FILE - Sudanese president Omar al-Bashir, 2nd from right, stands with other African leaders during a photo op at the AU summit in Johannesburg, June 14, 2015. But international criminal justice lawyer Angela Mudukuti of the Southern African Litigation Center said South Africa set a poor example. “Well our position, obviously, is that South Africa had a duty to arrest President Omar al-Bashir when he was here and that their failure to comply with that duty has been ruled unconstitutional and invalid, and we support that judgment. And that South Africa [has] obligations it had to adhere to and it failed to do so,” she stated. Kenya and Congo, which are members of the court, have also allowed Bashir to visit without arrest. Bashir spent no more than 48 hours in Johannesburg during the summit and gave no speeches, while avoiding the media. But that trip was the closest he has come to being arrested since he was charged by the ICC in 2009 over the long-running conflict in Darfur, where the United Nations estimates some 300,000 people have been killed and more than 2 million have been displaced.